(Seychelles News Agency) - Maximising earnings from tourists on cruise ships and engaging in more group marketing are some of the areas that Seychelles will focus on as it assumes the presidency of the Vanilla Islands from Mayotte. 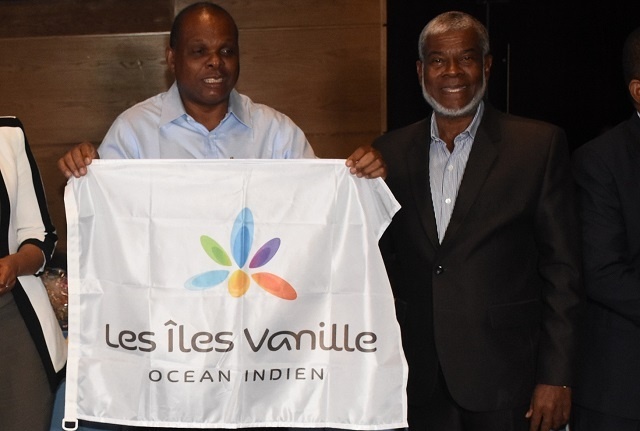 The Indian Ocean island nations of Seychelles, Mauritius, Madagascar, Comoros, Reunion, Mayotte and Maldives initiated a joint travel brand under the banner ‘Vanilla Islands’ in 2010. The concept was created by tourism professionals of the six islands to strengthen tourism initiatives between the islands and help implement bilateral initiatives. It is Didier Dogley, the Seychelles’ Minister of Tourism, Civil Aviation, Ports and Marine, who will head the group for the coming year. The flag of the ‘Vanilla Islands’ was given to Dogley during a ceremony on Monday marking the official handing over of the presidency. He outlined that focus will be placed on areas that are important, not only for Seychelles but for the group as a whole. “My plans include continuing the work being done with cruise ships, and see how we can optimise earnings and benefits that the islands get from tourists onboard cruise ships,” said Dogley. The cruise ship sector is an area that the former president of the organisation was already working on. During his term Ramadani established partnerships with various cruise liners, hence creating an increase in the amount of tourist flow in this sector. Secondly, Dogley said that the islands need to gather relevant statistics and share them in such a way that will allow the ‘Vanilla Islands’ to make better decisions. A way to achieve this is to better understand and analyse the statistics received. Thirdly, the minister said that the islands will continue to work on group marketing as this tactic is one that works really well within the region. Before the handing over of the presidency, representatives from member countries -- namely tourism ministers and heads of tourism organisations -- met in a general assembly. They discussed last year’s achievements as well as the programme, propositions and budget for this year. The bulk of financing will go into the marketing of the organisation through their webpage and social media platforms to sell the Vanilla Islands. At the same time, the group will continue to have a strong presence in international fairs where cruise ships are present so as to sell the region better.